"My favorite candy growing up was the chocolate covered cherry. The way that thin, crisp chocolate would break away to reveal the florescent red maraschino cherry suspended in the clear syrup was intoxicating. What about a savory dish that celebrated the same basic flavors?" Whisk cocoa powder, ancho chile powder, cumin, black pepper, and chipotle pepper in a bowl. Set aside. Generously season tenderloins with salt, then coat in the cocoa powder mixture. Heat vegetable oil in a large skillet over medium-high heat. Place tenderloins in the skillet and reduce heat to medium. Cook until browned on each side, about 4 minutes. Transfer tenderloins to a baking dish; cook in the preheated oven until pork is slightly pink in the center, about 20 minutes. An instant-read thermometer inserted into the center should read at least 145 degrees F (63 degrees C). Whisk cherry preserves, vinegar, and oregano in a small saucepan over medium heat; bring to a boil and cook 30 seconds. Remove from heat; season with salt and pepper to taste. Spoon sauce over pork tenderloin and serve. 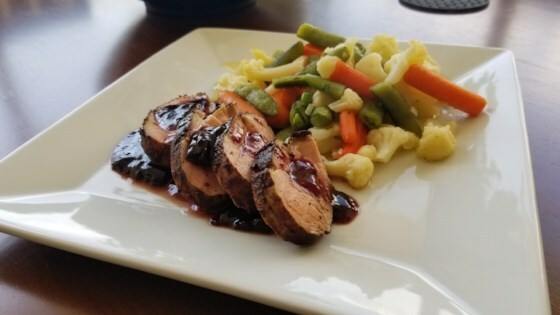 See how to make an incredibly easy pork tenderloin with black cherry sauce. Very good! The taste of the spices with the succulent pork made for a great dinner. The pork turned out beautifully, however no one in my family liked the cocoa taste. We ended up scrapping off all the coating. Very good and easy. Plan on making this again in the future.